I have researched and actively performed Western Magick & Sorcery for 5 decades. I wrote 15 Magick books under the pseudonym: SaToGa. I expanded my areas of expertise and moved on to the Internal Alchemy of the Eastern variety. I was on most of the earliest occult-related BBS bulletin boards at the advent of the Internet. I went by many other names prior to this current installment of SonOfTheGods. I try to stay as anonymous as possible- thus the masks in my videos and photos. I have never ever charged any money, nor asked for donations, of any kind. What ever I give, I gave freely, without ever expecting anything in return. I still do not want anything. I realized that most of the teachers were nothing more than either deliberate or naive charlatans and scammers. Previous owners had that mopai.forumotion URL for their forum. They dumped it and I grabbed it immediately to rebound and capitalize off of their infamous success. Many people search for "mo pai" and I have something better to offer. I try to deter them from practicing "mo pai" and try my Techniques instead. I have mixed what works from the West and the East. When I opened this forum I was posting generous amounts of material- daily. It attracted many people, but most of them just lurked in the shadows. You can not operate a forum without participants relaying feedback. So I turned it into a Blog and kept posting information. Then I briefly shut it down and extracted all the information I had previously posted. I organized it and compressed it all [WinRAR] into easy to follow, Free lesson plans. Due to my becoming "free competition" many teachers tell their students to avoid me. Why pay for the cow when you get the milk for free? Be an active poster in this community. The 10 WinRAR consist of htm. files that were "save page as" to keep the integrity & all original files such as animated gifs, charged symbols, illustrations, digital photos, PDFs, Videos, Audio, etc. Again, I am a competitor with free and better information. In order to protect that integrity and also a lifetime's worth of my own personal work- I put a "Tulpa" or what I call an "Egregore" to "Watch" over all my materials. LoneMan Pai ™ = The Egregore is My Copyright Insurance. My Sentinel will cause big problems if you deliberately decide to troll any aspect of LoneMan Pai ™. Why test it? Just ask me- it is free. And it works. If you are lazy or very much desire being in the daily mundane rat race- please do not waste your time or mine. 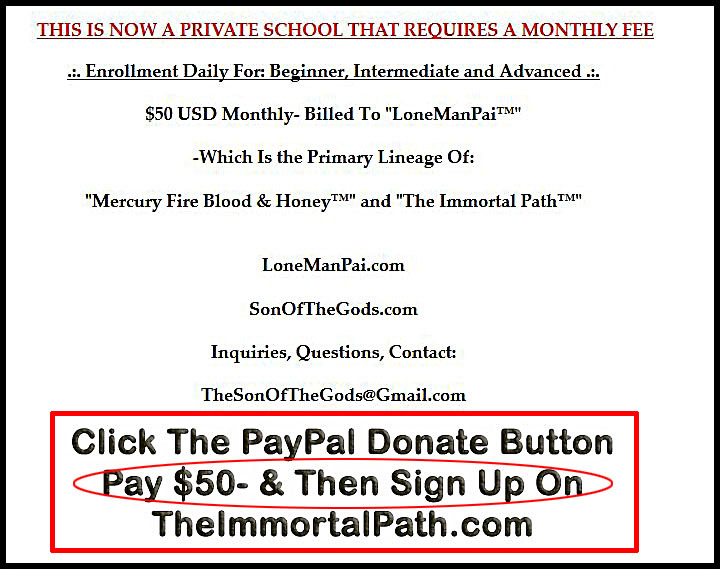 LoneMan Pai™ is about becoming your own god- rather than relying on some external being (religion) to carry you. The LoneMan Pai™1 brand is a simple do it yourself practice regimen. In this high tech age....no one is going to sit at guru's feet while most are pirating at someone's expense. Like gears in a machine- it all works in conjunction with bigger and smaller parts. 1. "LoneMan Pai" is a pun on "LongMan Pai" which has quasi-political/racist and costly monetary barriers that will keep the average student financially distraught and spiritually frustrated.